Whilst at a workplace, we are all alone by ourselves. It is just us and a group of unknown people working together. This group of unknown people, called colleagues, makes the workplace better and easier if they start Building working Relationships. It becomes very easy to work if we have a good relationship building activities with our co workers and maintain relations with them. Developing relationships with our work colleagues reduces tension and stress at the workplace and make the environment free and comfortable to work with. This in turn, enhances our efficiency at work. One good thing about spending time at your workplace is you get to know your co workers differently. You get to spend equal time with all of your team mates, which in turn add on to the quality of working together. Always, take time to know your team mates better, you never know, what common interests you both would share, inside and outside of work. For an introvert, it is next to impossible to share everything with a complete stranger. In such cases, give time and space for one to blossom, so that when the awkward period is done, you can easily start communicating with your team mates. You never know, who might just turn out to be your true and good colleague and a partner in crime kind of best buddy in the near future! One good and easy way for building positive relationships with office colleagues is looking out for a common interest between you all. There might be several instances where two persons clicked instantly just because of their interest in a particular thing. Such things are likely to happen quite a lot if you openly communicate with your counter parts. For this, you need to have an open mind, free of stress and tension. Focus on an interest that might be of common interest to both of you. For instance, you might like the same TV show, talk about pets, same respect for one football club and many more. What might seem to be a loose conversation may lead paths to becoming best buddies in the next few days to come. This is no vague statement, but a truth of life, which most people tend to wipe out. People are tending to working endlessly for hours and hours because ultimately it’s the money and hard work that pays off. Yes, it is absolutely true. But then there is an addition to it. One must work not just to earn money, but to earn the trust of their co workers. One should learn to build a trust between co workers and there should be a positive environment within the work place. Trust is the basic foundation of any relationship to grow and blossom. It is the first level of a healthy relationship. Hence, one must learn to trust, even with the ones whom you find it to be difficult. This is not in context just with your behavior, but also with the co workers you tend to work with. You must speak positively about others, especially about your co workers, with all of them, including your boss. This brings positive vibes in the workplace and the ones who are cruel enough also tend to melt after listening to your appraisals and compliments. A person must know how to tactfully handle crucial situations and thus, bring joy and trust amongst the workplace. Provide quality feedback about everyone . This will regain the quality of relationships and thus help to strive for a much healthier environment in the workplace. This is the major key to success whilst building strong relationships. One must know how to effectively handle and prosper out of this situation. Whilst at work, one must appreciate and compliment other people’s work, be it a bad one or a good one. This encourages the other person in knowing you a little more and hence will add on to the effectiveness of one’s relationship at work. Also, ask how you can help them in their work. This will ultimately form a closer, greater and deeper bond with the two of you and will allow your relationship to blossom. 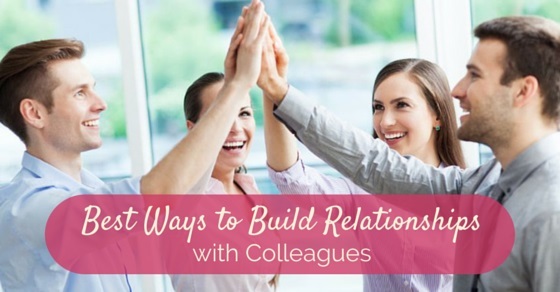 These things will in turn play a vital role in nurturing your relationship with the other person and bring peace and loyalty in the work environment. The universal statement, “Sharing is caring” comes in place now. Share your knowledge with the people at work. This will not only allow your relationship to glow, but also set a path on the journey towards knowledge empowerment, in a positive way. Share your knowledge information of work as well as something of outside work. It may be surprising that your knowledge will help you in collecting information about the other person and amuse you to know that even they like it too. You think of them and help them with the right amount of information of knowledge and content. Positivity is something every person should wear every day. It is something which lightens up your inner soul and your inner decisiveness to be bright and excel in every god damned thing that comes in your way. If you have a positive mind and attitude, nothing can stop you from achieving what you are made for and what goes on with your name. It is a common saying that positivity is contagious. If one person in a department is positive enough to take up challenges and carry them easily, it inspires the rest of them to think in the same way and act on the same level. Imagine, a group of ten charged with the energy of positivity climbing their steps toward success, what would possibly stop them from achieving it? Nothing, hence you must wear your style of positive at ease. This is the easiest way to build a relationship with anyone. All you need to do is attend a social gathering and the rest would be done on its own. At social gatherings, the mood is usually jolly and entertaining, adding on to your requirement of bonding with someone. This is the best place to know someone, share your interests, knowledge and space as well. Events like lunch and dinner with co workers are useful enough in creating a bond. All you need is a spark of bond to be seen, hitting on it, and then going with the flow. Remember, you have to reach out to people and let them know who you are and how your relationship will be greater and stronger with them. This is one thing that every individual working in a firm must know. Avoiding cliques not just helps the entire firm to glow and blossom, but it also helps the firm to be known as a family, and nobody would dare to cause harm to a family full of positivity. Sometimes, in the fist of knowing new people and getting along with a group of them alone causes clique in the firm as the rest of them are considered less important and they feel neglected. This is something that should never, ever, happen in any firm. It breaks the unity of the colleagues at work and the lesser you care; the more intense and intensifying your relationship with other colleagues turn out to be heading a rough patch. Branch yourself, hang out with each and every one possible, share your knowledge with all. Do not corner yourself with a group of people. This way you would not be alienating anyone in the firm. Stop cribbing, as it is mentioned earlier. Once you start cribbing about a certain person in the company or about a certain issue, you would suddenly find yourself in the fist of being hated. “Mom, mom, look, and this so and so person are not being nice to me.” Although, it would not exact sound like this, but trust me, the head of the department would feel like a 5 year old kid is complaining about another 5 year old kid. Get rid of your anger management issues, and try to get along with people. They would be rough to you in the first place, as it is a new environment for all, but eventually things would cool down, and everything will be sorted. An advisable tip to know your colleagues better is to be honest and communicate freely with them. An open mind and an open heart is the key to success. Honest people are more likely to develop greater relationships with people as compared to those who are totally not honest or less honest. One must encourage oneself to be honest with himself/ herself as well as the other person. That is the way in which relationships at work are built. One can know what is happening in the other person’s mind just by looking into his eyes. All this helps in building healthy relationships at work and taking them to an extremely different level. Thanking people out of generosity is the most courageous and applausive way of building a relationship. Look out for instances wherein you can see a spark of bond between you and your co workers. Initiate them in helping you, indulge them in big projects, give them recognition, and credit them. Saying thank you will definitely bring a bond sparkling between you and your co workers on an intra personal level. This will help the co workers to help you in future assignments, which will in short, add on to their benefits of the company/ firm where you are working at. Appreciate and show gratitude to your co workers. Demonstrate them in an acceptable way. Having friends at work also helps to overcome the load of pressure amounting to your work which in short leads to deficiency in the good work quality. Building healthy and good working relationships with colleagues will open doors to career advancement, key projects and raises in the job position. It allows the ones who are working over you to know that you are capable of dealing with any situation and knowing your co workers well, thus adding on to the positive work empowerment and job quality. If you are happier and merrier in your work place, then nothing can stop you from being happier outside of work. Set your limits and go on in knowing your counter parts as well! Previous articleHow to Convince an Employer to Sponsor Green Card?